Recently I was contacted by StickerKid, a company in Switzerland that has been making good quality labels since it started in year 2004. They are expanding to Singapore & other Asian markets and wish to create awareness of their products through DinoFamily. I went to their website to look at their products and was instantly attracted by their vibrant colored labels of various sizes. Besides producing stickers for belongings, they have ironed-on labels and wristbands too~ how cool is that! "Our stickers survived microwave, dishwasher, water, sun and sand." "Our iron on labels will withstand 45 machine washes at a temperatures of 60 degrees Celsius. These labels are washing machine and tumble dryer resistant." I couldn't wait to start choosing the stickers with DinoBoy. I thought it was a simple chose and click task but it took DinoBoy about 15mins to make his final decision as there were so many cute little icon to choose from. He can't decide the color of the stickers for the different labels too. I tried to persuade him to pick the cute little monster logo but he insisted on the cute little sea horse. He finally made his final choices and we sent in our order. So many choices to choose from! So many more in the website! Here's a screen shoot of the ordering options. After you are satisfied with your sticker simply click the "Order" button, then sit back and wait for your beautiful stickers to be delivered to you. About a week later we received the package all the way from Switzerland, the labels are packed into 2 ziplock bags with a label indicating the purpose of each set of labels. They even included an instruction letter on care and usage of the stickers. StickerKid is telling the truth when they say that they use top-of-the-line material to ensure longevity in their product. The stickers are thicker and icon or logo though small are printed with clear details. I absolutely love the bright colors! I immediately put a sticker on DinoBoy's swim board for a trial test during his swimming lesson later that day. About 2 hours later the sticker is still there, sticking firmly onto the board. I tried rubbing fiercely on the sticker with my fingers to see if it moves (even for a millimeter) after being soaked in the chlorine water but it did not. The sticker does not even have any creases on it. 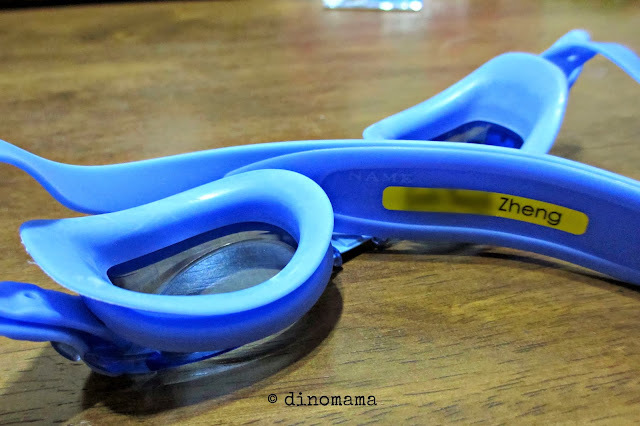 I'm 100% satisfied and went ahead to label his goggles (why not? 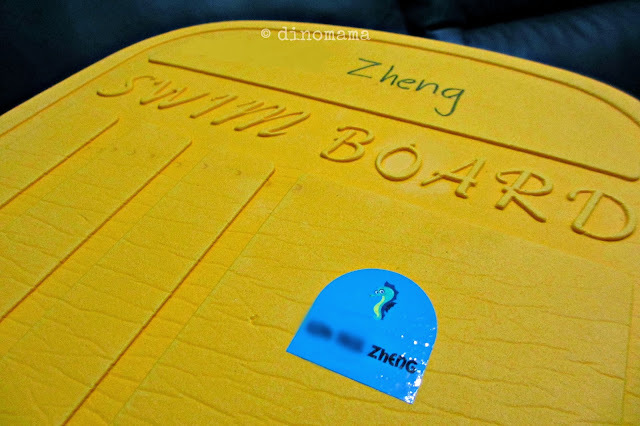 Swim board has it, goggles MUST have too) and water bottle. the bright green sticker & the smiling sea horse adds color to the black & white water bottle, making it cheerful instantly. Alright people, we have 2 great deals for all of you out there! Since StickerKid mail orders to every corner of the Earth so yes, these deals are open World Wide! 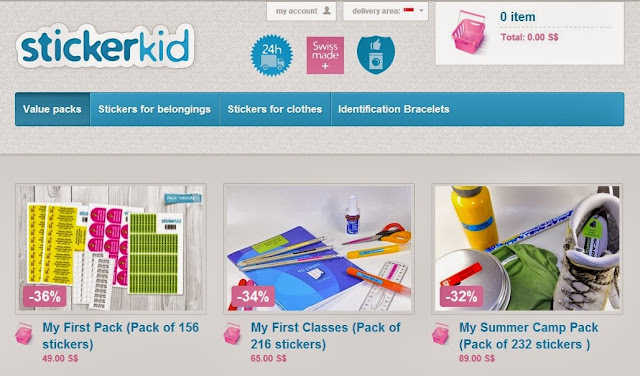 Great Deal #1 - Place your order with Sticker Kid before 31 October 2013, quote DinoMama2013 and received 10% discount for all products! 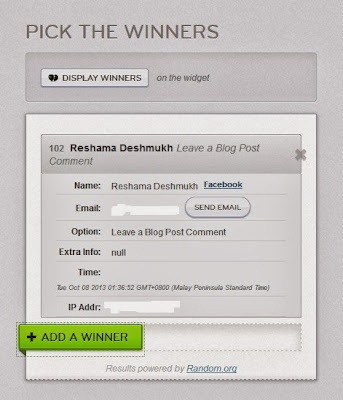 Great Deal #2 - A world wide giveaway! Sticker Kid is sponsoring x1 My First Pack stickers, consisting of 156 stickers with the value of S$55, including shipping costs, to one very lucky winner~ Simply just follow the steps below to enter the giveaway. 4. Giveaway will run from 07 to 20 October 2013 @ 2359hrs and winners will be announced in our blog and facebook page. 8. This is a World Wide Giveaway. 9. All personal information will be deleted at the end of the giveaway. 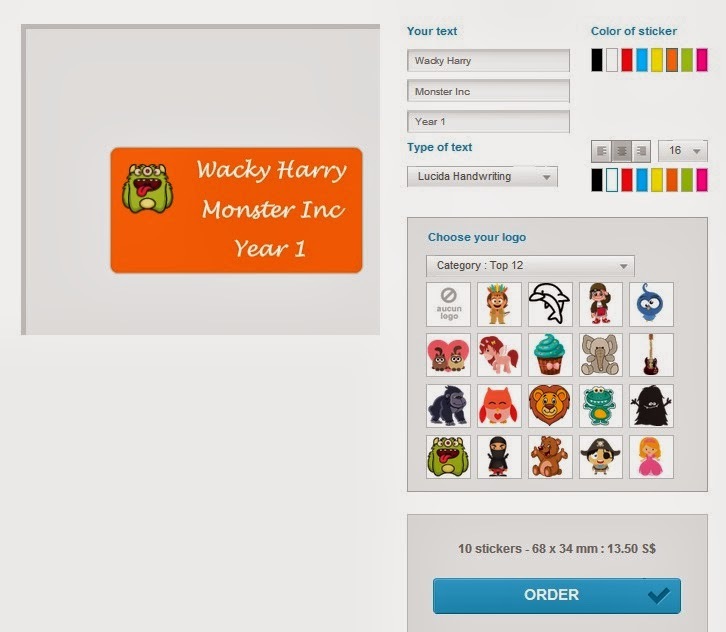 ''My First Pack'' has all the stickers you need to identify your belongings. Ideal for the first years in kindergarten, thanks to these stickers you will not lose anything. 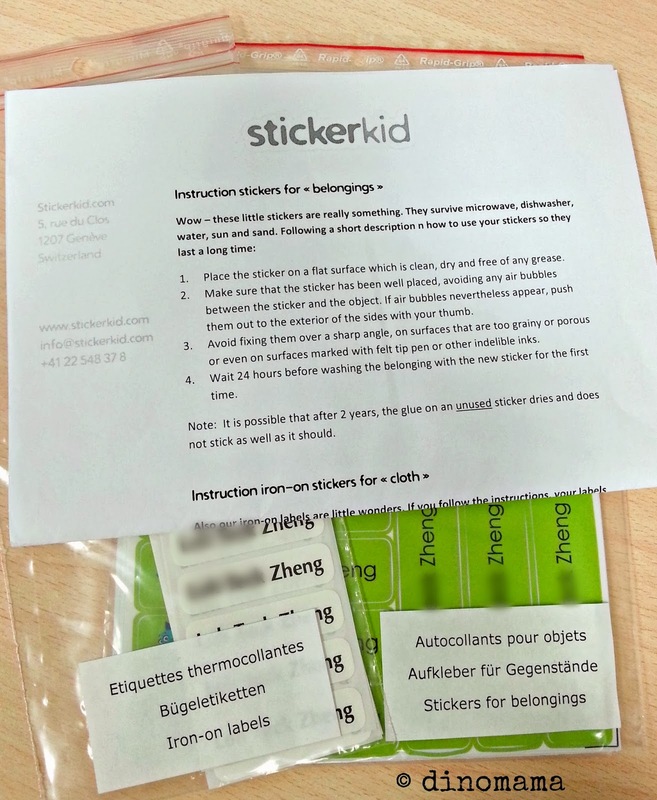 Remarks : We received a set of My First Pack stickers from Sticker Kid for the purpose of this review. All opinions & views are 100% by the DinoFamily. 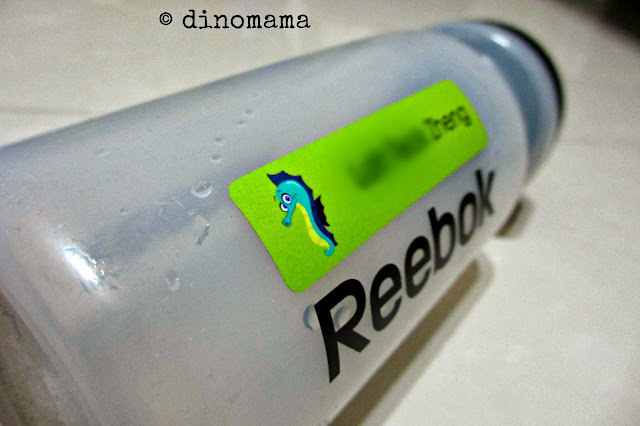 To protect his identity DinoMama has blurred out most of DinoBoy's name on the stickers. Oh my I love stickers!! These look cute- wish I had them when I was a kid! LOL its nothing but the truth! Wow... thanks for organising this giveaway! Waterproof stickers will be just so useful! I want!! My boy is starting childcare soon...This will come in handy. I want! My boy is going childcare soon...This will come in handy. My sticker loving DD would love to get hold of these! thanks for hosting the giveaway! My DS will love it! Me ! Me ! I want to win a pack for Baby Vera ! My boy is heading to P1 next year. He's always "misplaces" his stuff, the stickers will really be handy. Ms Piglet, your reply made me almost hit the delete button! Seriously!!! Takes me 3 seconds to get the "ding" in my head.